Computer GATE CSE Paper 2014 Solved: Graduate Aptitude Test in Engineering (GATE) Examination 2014 for Computer Science and Engineering (CSE) held across various centers across India via Online and Offline Paper based mode. 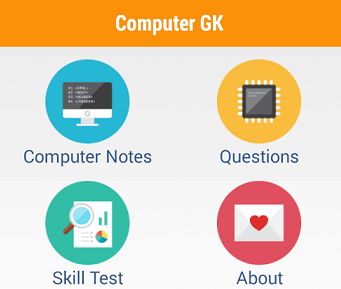 Here is collection of Computer General Knowledge (GK) Questions asked in papers to candidates during the examinations. We are providing some Questions of SBI Probationary Officer (PO) examination 2014 on our website www.computergk.in dedicate for various examination like SSC, UPSC, Railway, IBPS, SBI PO, Clerk and other state examinations. A. make parsing and semantic analysis simpler. C. increase the chances of reusing the machine-independent code optimizer in other compliers. D. improve the register allocation. 1) Static allocation of all data areas by a compiler makes it impossible to implement recursion. 2) Automatic garbage collection is essential to implement recursion. 3) Dynamic allocation of activation records is essential to implement recursion. 4) Both heap and stack are essential to implement recursion. A. in all candidate keys of R.
B. in some candidate key of R.
C. in a foreign keys of R.
D. only in the primary key of R.
Download Full Solved GATE CSE Exam Paper 2014 Solved OR Check it on our "Computer GK" App.